Puhhh, slept a long time today and I must go right back in the direction of Offenbach and meet one of my ex-girlfriend for dinner in a Belgian restaurant, I’m looking forward to it. 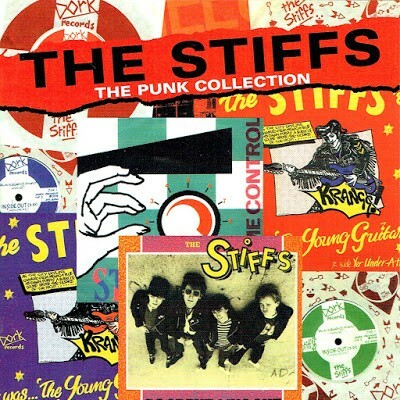 But now to the Stiffs, an English band, variously referred to as Punk, PowerPop and PopPunk, hailing from Blackburn, Lancashire. Championed by Radio 1 DJ John Peel, their most successful singles were ‘Inside Out’ and ‘Goodbye My Love’. Band members are Phil Hendriks (vocals/guitar), Ian ‘Strang’ Barnes (guitar/vocals), ‘Big’ John McVittie (bass/vocals) and Tommy O’Kane (drums). The Stiffs were formed in 1976 by 14-year-old school pals Phil Hendriks (lead vocals, guitar) and Ian ‘Strang’ Barnes (guitar/vocals), joined by Tommy O’Kane (drums) and Mark ‘Ossie’ Young (bass guitar), and played their first gig at East Lancs Cricket Club in 1977. Following several local church hall and youth club bookings playing a mixture of covers and original Hendriks/Barnes compositions, Young was replaced by ‘Big’ John McVittie (bass guitar, vocals). Their first single ‘Standard English’ b/w ‘Brookside Riot Squad’ / ‘DC-RIP’ was released on their own Dork Records label in early ’79, now regarded as rare and collectible. In December ’79 the band, having tightened by this time into a powerful live act despite being legally unable to order a pint at gigs, released their second single ‘Inside Out’/ Kids On The Street, recorded at Oldham’s Pennine Sound Studios on a budget of £75, produced by engineer Paul Adshead and the band, embodying the bands musical progress, amalgamating melody, power and energy. A mistake at the pressing plant led to the first 1.000 copies having the labels printed on the wrong sides. This compilation from Captain Oi! is a collection of the band’s singles plus many hitherto unreleased demos and masters, covering the bands entire history.